After you play an action, give a random friendly creature +1/+1. Artaeum Savant is an epic Willpower creature card. It is part of the Core Set. "Wha? Oh, sorry. I was busy doing the fishstick." 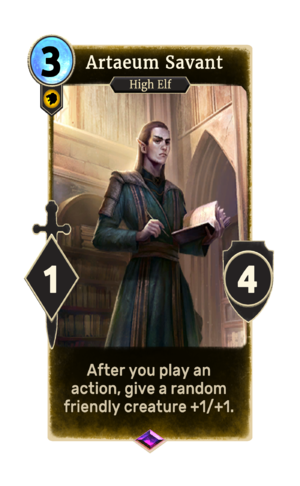 This card's summon ability applies the Boon of the Psijic card effect. The card is named for the Isle of Artaeum. This page was last modified on 15 February 2019, at 11:44.